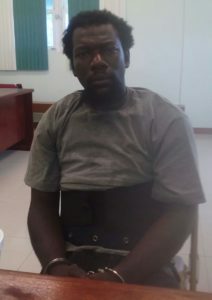 Basseterre, St. Kitts, July 30, 2017 (RSCNPF): A man wanted in St. Maarten suspected to be involved with a number of murders and who escaped from prison in February (2016) was captured in St. Kitts on Saturday morning (July 29) by a patrol of Officers from Police District “B” who responded to the sighting of unusual activity along the coastline in Cranstoun Bay, an area in the vicinity of Newton Ground. Initial investigations determined that the person detained had illegally entered the Federation, and was later identified as Kathron Fortune a citizen of Grenada who resides in St. Maarten..
Fortune had in his possession when captured, a high powered rifle and scope, a bullet proof vest, a backpack containing a quantity of cured marijuana, hashish (a marijuana derivative) and a sum of United States currency. He was arrested, formally charged and cautioned for Possession of a firearm and ammunition. He was also charged with entering the Federation illegally, Possession of Marijuana and Possession with intent to supply. Other charges will be laid as the investigation continues. He is remanded at Her Majesty’s Prison. 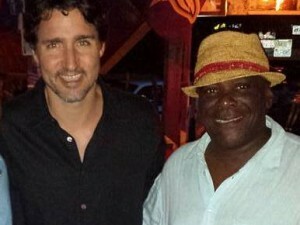 The St. Maarten authorities have been notified of his arrest.